The CERF Exporter is designed to allow users to convert exported .ZIP bundles (containing only .XML files) into human readable files in their original native format along with accompanying CERF metadata. This is the best way to ensure that the data you have archived from CERF as .ZIP bundles can still be accessed even if you no longer have access to CERF. 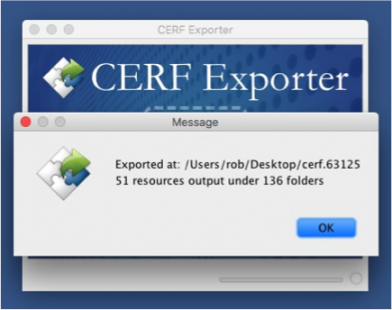 Users with the CERF Administrator role can export Notebook Pages, individual resources or entire collections (i.e. Notebooks or File Cabinets) from CERF using the administrator’s web-based interface. The resulting .ZIP bundles contain everything that was inside the original collection. 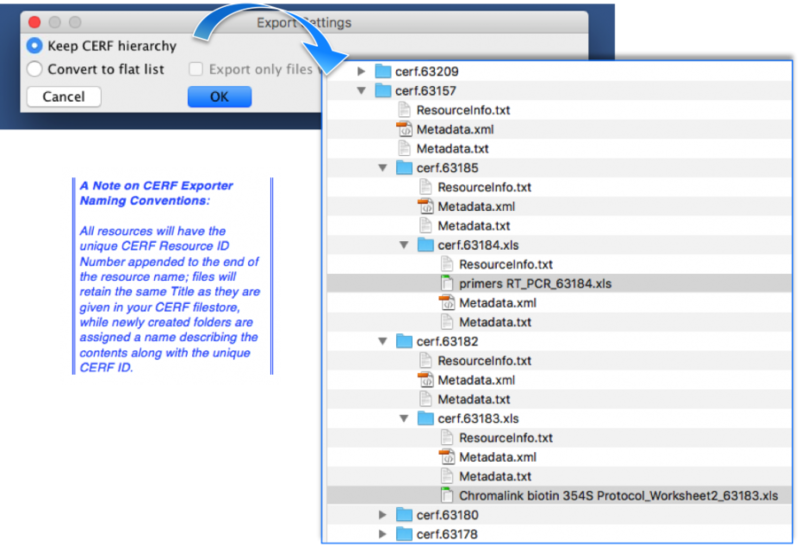 The CERF Exporter App can then be used to process or “unpack” the exported .ZIP bundles and output the content as either a nested hierarchy or flat files. If the user chooses “Keep CERF hierarchy” then the output includes all CERF containers such as Folders, Notebook Pages, Sections and Entries. These containers are represented in the output as folders named using the unique CERF ID number for that container or resource. The data is organized with the same hierarchic structure that was used in CERF. Each resource or hierarchic container also includes .XML files and .TXT files that list any relevant CERF metadata that was associated with that container or resource. If the user chooses “Convert to flat list” then the output contains only the original data files that were added to or created within CERF. The container hierarchy and the associated metadata files are NOT included in the output. 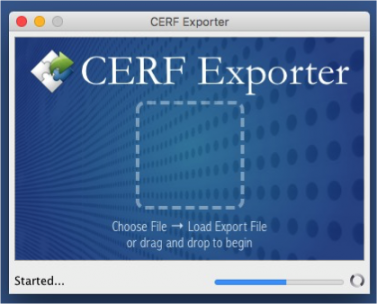 To begin unpacking an exported .ZIP bundle, launch the CERF Exporter App. Choose the File menu > Load Export File and select your exported resource .ZIP file, then click "Open"
Or, nagivate to the location on your computer containing your exported resource zip file and drag-and-drop it onto the CERF Exporter window. 3. Choose the organization type you prefer. The default option creates a folder containing a nested hierarchy of files and folders replicating the organizational structure used in your instance of CERF. Associated metadata will be added as txt and xml formats. Alternatively, you may wish to export your files as a flat list in their native format without any metadata or resource information. Your flatlist can also be filtered to include only a specific file type. 4. Unpacking of very large collection may take some time. The progress bar will give an indication of the amount of work remaining.